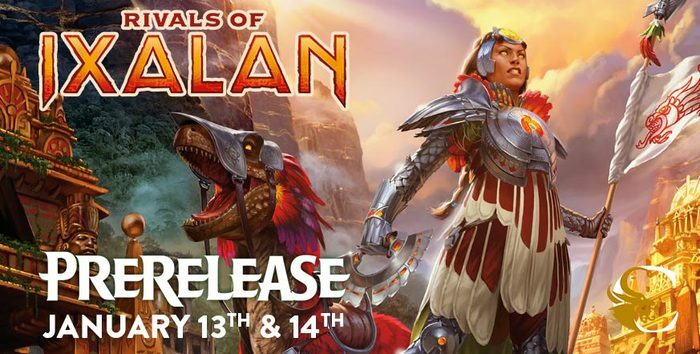 This weekend saw the Prerelease events for the newest Magic: The Gathering set, Rivals of Ixalan. I already had plans for most of the weekend, but was able to attend the Sunday event at 1pm. I attended at my LGS where I took part in the Ixalan prerelease as well, and just like the first time I was not disappointed. I have been very lucky with my pulls from packs over the last year or so. Not only have I pulled both an Invention and an Invocation from the past two masterpiece sets (Kaladesh block and Amonkhet block), but I’ve managed to pull some of the desirable cards from these past two Ixalan sets as well! Unfortunately I was only able to stay at the event long enough to crack my packs, throw together a 40-card Simic Merfolk deck, and beat my first opponent 2-1. At that point I had to jet, but got a participation pack as well that also had a decent rare inside! I’m curious what would have happened had I stayed, as my roommate managed to essentially win the whole thing and earned extra packs. Regardless, it was a good time and I felt I got my money’s worth for the small $30 investment. On top of the normal chaff that is to be expected from a small pile of packs, I ended up with cards that I needed for decks that I’m constructing, and Dinosaurs are going to be amazing at this point. Once the set officially releases next week I’ll be placing an order for singles and finishing that deck off finally, along with getting some additional power for other decks. People were hoping that Zacama was going to be a 5-color elder dinosaur so they could utitlize the other five mono-colored elder dinosaurs, but I’m just fine with the card being Naya, and slotting right into the 99 of the Gishath deck I’m building. Not only is this card very versatile on its own, but I could use it as an alternate commander for the deck and that’s more useful to me. Zetalpa is going in the same deck, along with the Green and Red elder dinos. Amazing stuff. I managed to also pull Tetzimoc, but without being able to use black in the dino deck, that one will collect dust for a while. It’s a great card, but I can’t use it at the moment. I pulled three of the Forerunners, but these are the only two I’ll use. 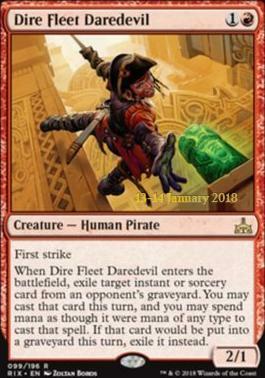 The Pirate one is only good in Pirate decks, and that’s not something I intend on building, despite owning an Admiral Beckett Brass. My dino Forerunner was also a foil, so that’s a bonus and I pulled a foil Goring Ceratops which is an upgrade of sorts since I already had a non-foil version. There were some other rares that I pulled but nothing too exciting. Overall I still managed to get my hands on some good cards, and I might be able to trade my roommate for some others that I need to finish off some of these decks. It’s a fun time, and I’m hoping to continue to go to these events as they come up. We’re also trying to use the opportunity to find some new members for our EDH group, and apparently a few people were invited from what my roommate said, so perhaps we’ll get the steady games going again. In the meantime I’m going to try and finish up the decks I’m working on to be adequately prepared when that day comes!